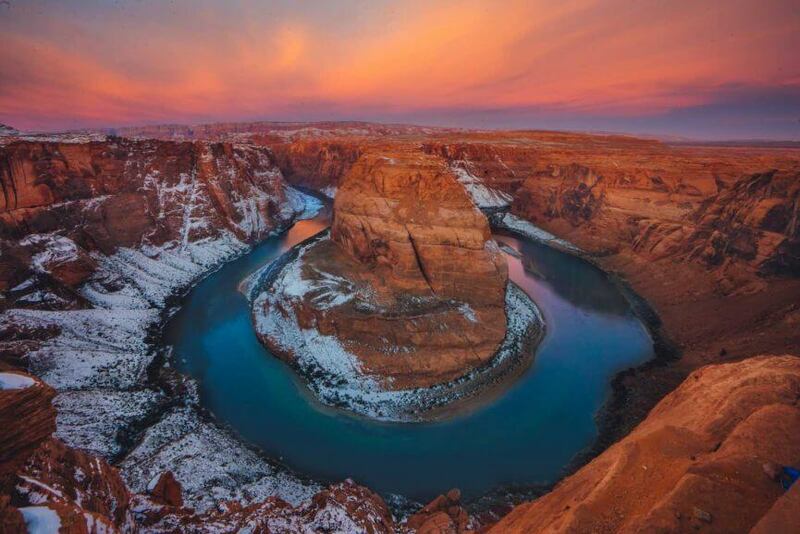 One of the most incredible places to visit in the Southwest with close proximity to many national parks, natural sites, Navajo land, and historic sites is Page, Arizona. Close to the border with Utah, there are several gems to discover, trails to hike, and natural wonders to enjoy. 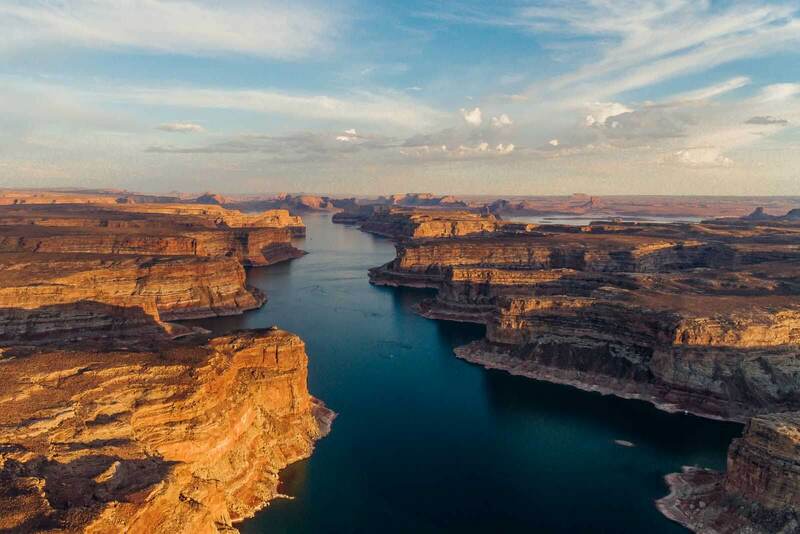 Check out our guide for all the best things to do in Page, Arizona and nearby to help you plan your next Southwest road trip or holiday. 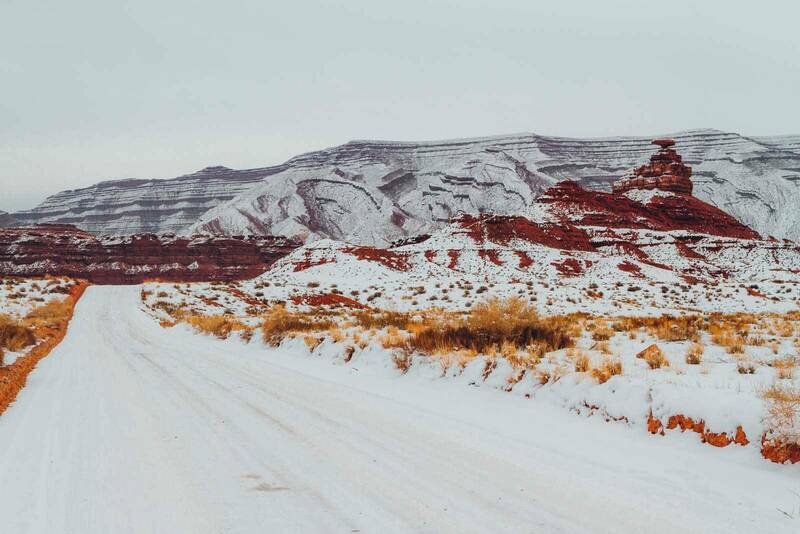 If you plan on doing more Southwest travel be sure to check out our guide for all the best things to do in Kanab, Utah and nearby as well! One of the best things to do in Page Arizona is visit Glen Canyon Recreation Area. 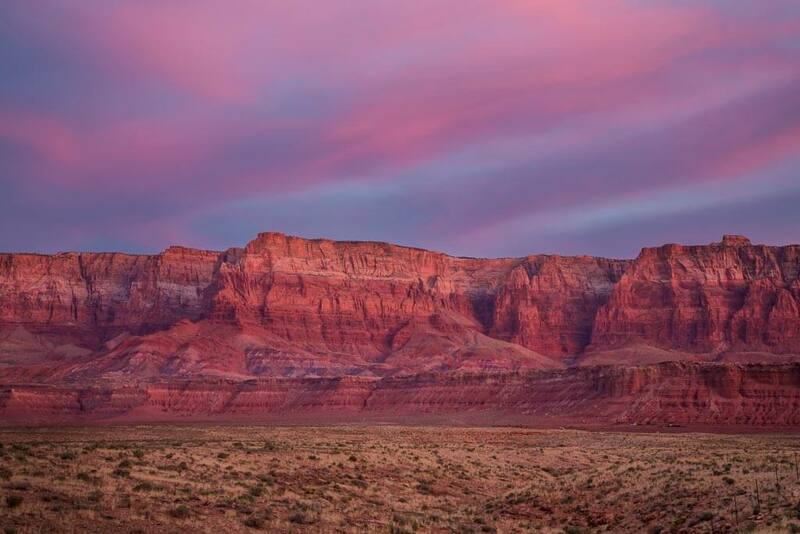 The heart of GCRA is in Page and is known for being home to Lake Powell, gorgeous canyons, buttes, and mesas. 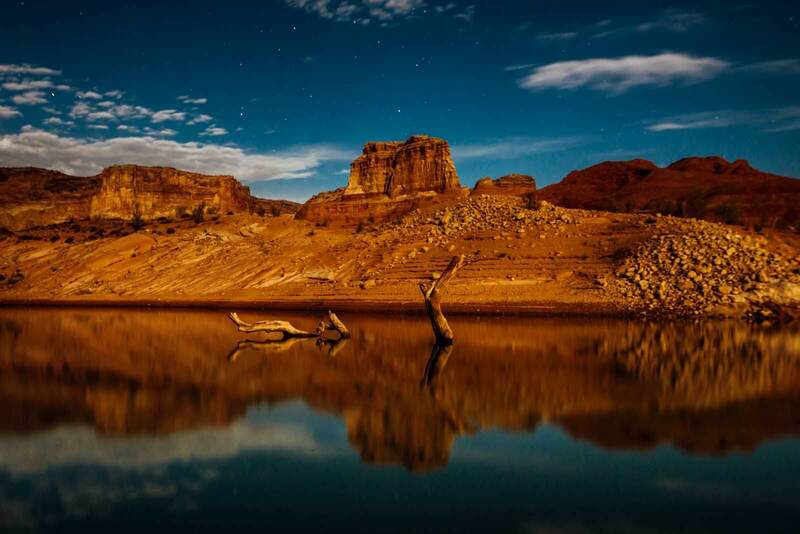 Lake Powell is arguably one of the most famous and best things to do in Page, Arizona. This man-made lake is a boat lover’s haven. The best place to take off on Lake Powell is Wahweap Marina, just a few minutes drive outside of Page. From here you can rent houseboats and spend days on the water exploring the endless canyons from the water. We did this last summer and it was an unforgettable experience. 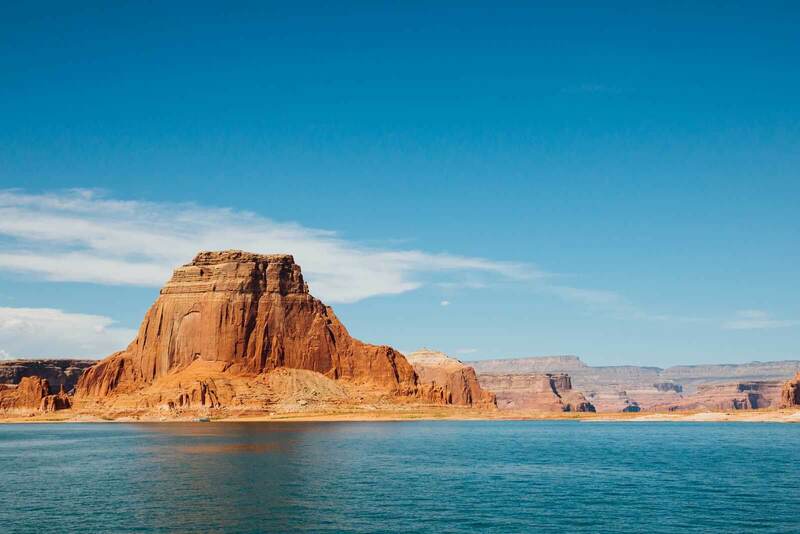 See our guide on everything you need to know about Lake Powell Houseboat Rentals. You also don’t have to commit an entire week to enjoy Lake Powell by houseboat either. You can do kayak, paddleboard, and boat rentals for the day here as well. One of the most popular places to explore this way is Antelope Island. Another great thing to do in Page, Arizona is visit the Glen Canyon Dam which sits 710 feet tall in Glen Canyon. This dam is used to generate power and water from the Colorado River for the west. 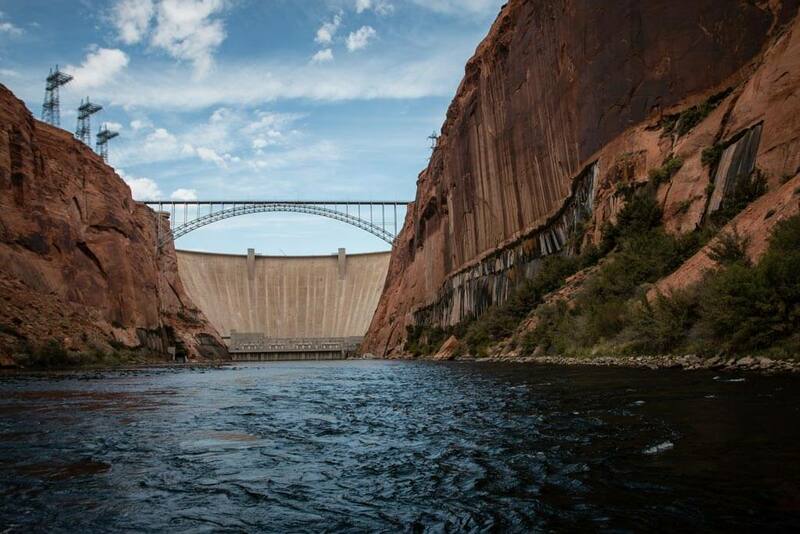 The Glen Canyon Dam is also the second largest concrete dam behind Hoover Dam in the United States! 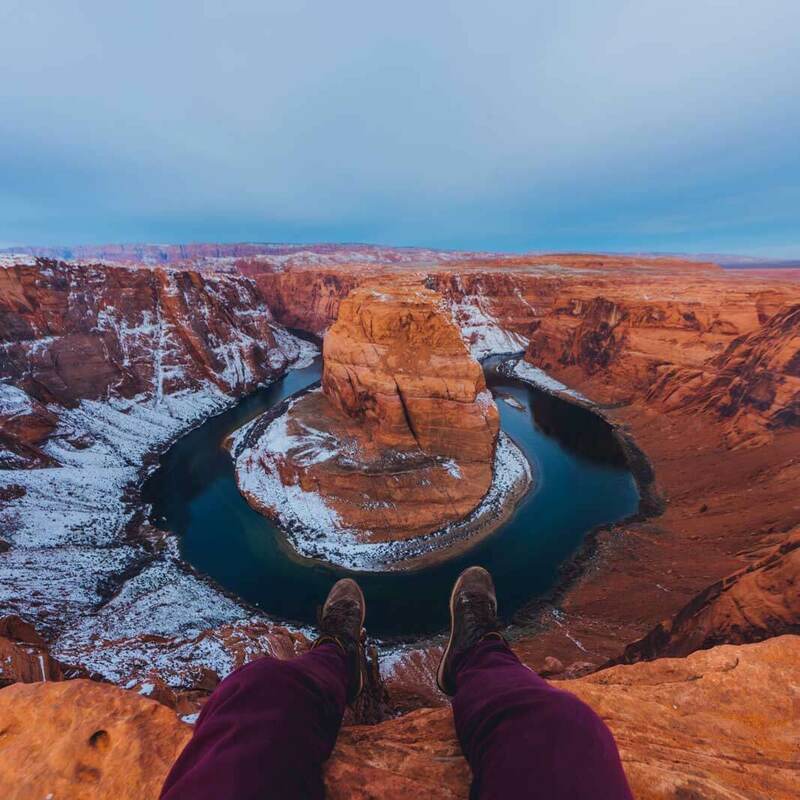 Rainbow Bridge is one of the most sacred and famous monuments in the Glen Canyon Recreation Area as well as one of the best things to do in Page, Arizona. It’s considered the tallest natural arch in the world! The best way to see Rainbow Bridge Monument is to access it from the water by boat on Lake Powell. 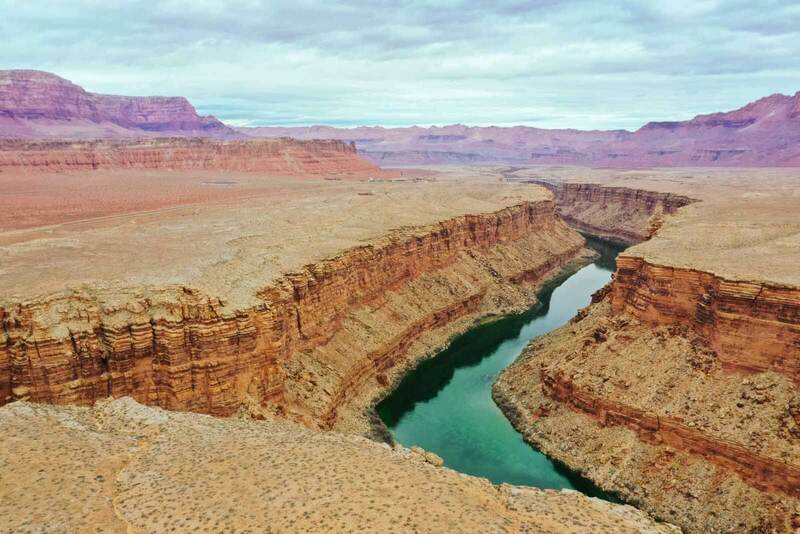 Not only do you get to enjoy the beauty of Lake Powell, but you can skip the grueling 2-3 hike to access Rainbow Bridge Monument otherwise by foot. We were able to see Rainbow Bridge from our time on our houseboat on Lake Powell. 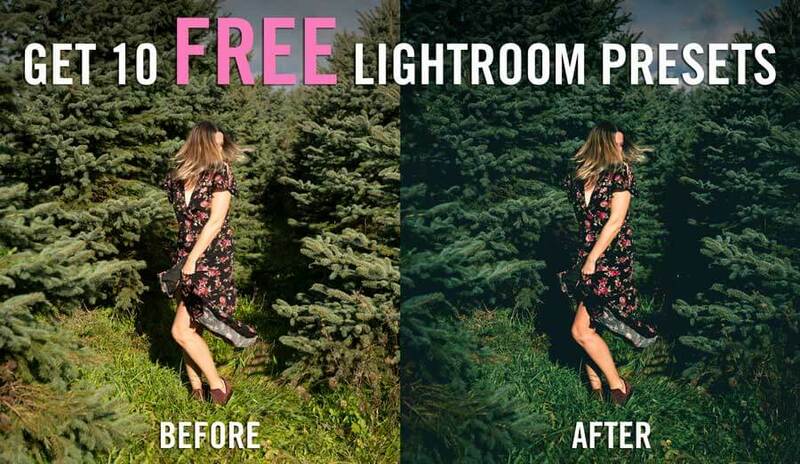 We recommend doing the same unless you’re up for the long hike to get there. Very few people attempt this trail due to its difficulty. It is important you do not attempt this trail if there is any rain in the forecast due to flash flooding. Lee’s Ferry is another great option for something to do in Page, Arizona just a short drive from the city center. This scenic viewpoint and boating launch ramp is the start of the Grand Canyon. This was also the famous point where before the Navajo Bridge was built over the Colorado River how people crossed by ferry. People come here to launch their boats for day trips and fishing. This is also where those finishing the multi-day hike through the Paria Canyon Wilderness area end. There are also plenty of day hikes launching from here through various canyons. 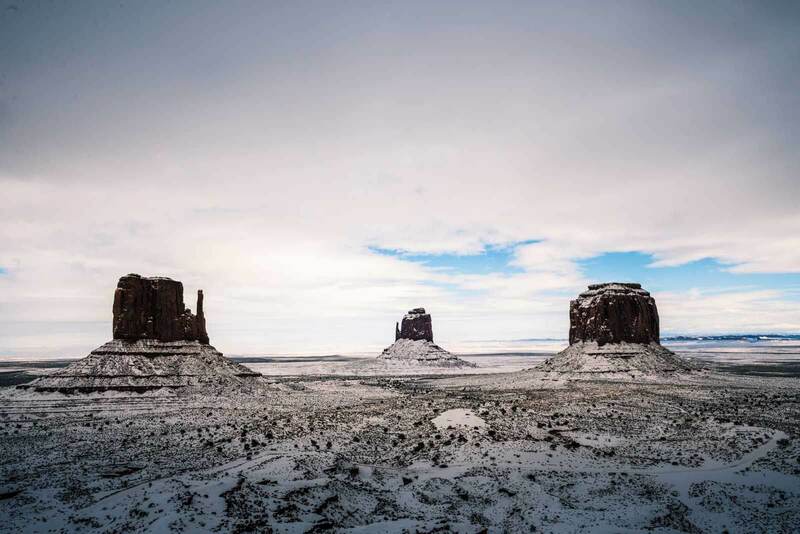 The Navajo Nation is a vast land of 27,000 square miles through the states of Utah, New Mexico, and Arizona run and managed by the Navajo tribe. Part of the Navajo Nation runs through Page, Arizona and offers some of the most beautiful natural landscapes and monuments of the area and some of the best things to do in Page, Arizona. 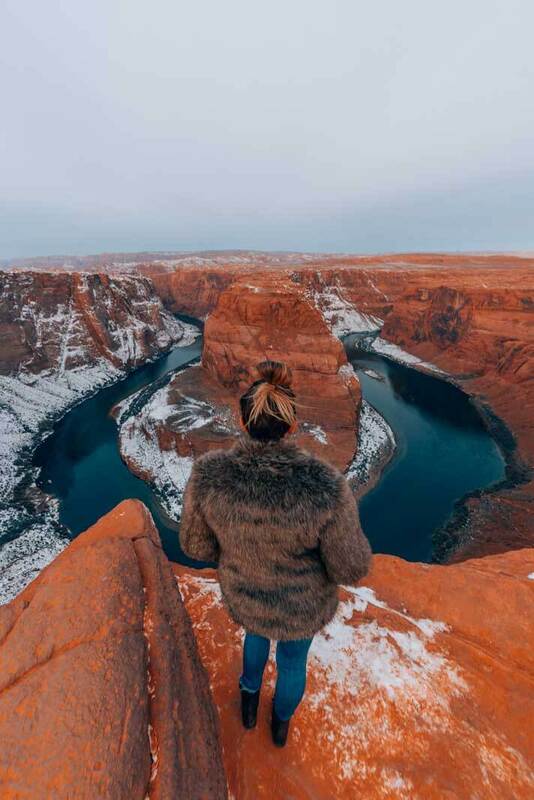 One of the most famous things to do in Page, Arizona is visit the famous Horseshoe Bend lookout and viewpoint over the Colorado River. You have most likely seen images of this place and it has risen in popularity over the years due to its easy access and distance to Page being only a 10-minute drive from the city center. We must warn you this is a very POPULAR and crowded tourist attraction. In peak season expect to be sharing this view with crowds of people. We visited in the winter season and sunrise and were even surprised to see how many people braved the cold morning to catch a glimpse of this famous viewpoint. We must say, even with the crowds it is totally worth it. From the parking lot it’s a short downhill walk to the viewpoint. There is only one small section that has a railing, everything else is exposed cliffs with a HUGE drop off point. Be sure to watch small children and do not get too close to the edge, a girl fell to her death just a week before our visit. If the parking lot is full, continue on to the next lot and there is a shuttle that runs back and forth. Another one of the most famous things to do in Page, Arizona is take a tour through Upper and Lower Antelope Canyon. These incredible slot canyons have become very popular because of their incredibly photogenic narrow and steep orange walls with the sunlight shining through. You are not allowed or able to visit Antelope Canyon’s upper or lower slot canyons on your own. You have to join a tour with a Navajo guide. There are tons of tour companies throughout Page that offer these tours. 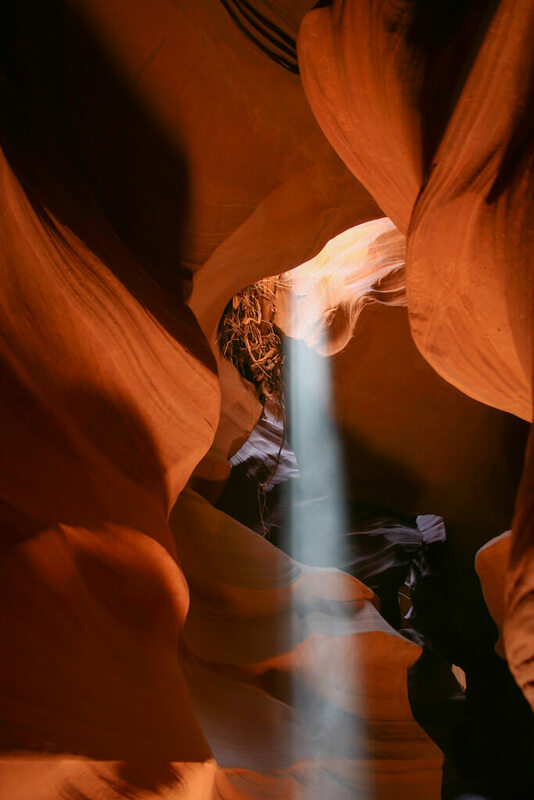 If you’re looking to get the iconic shot of the sunlight shining through the slot canyon you will make sure you want to join a tour between 11 am – 12 pm April through September. 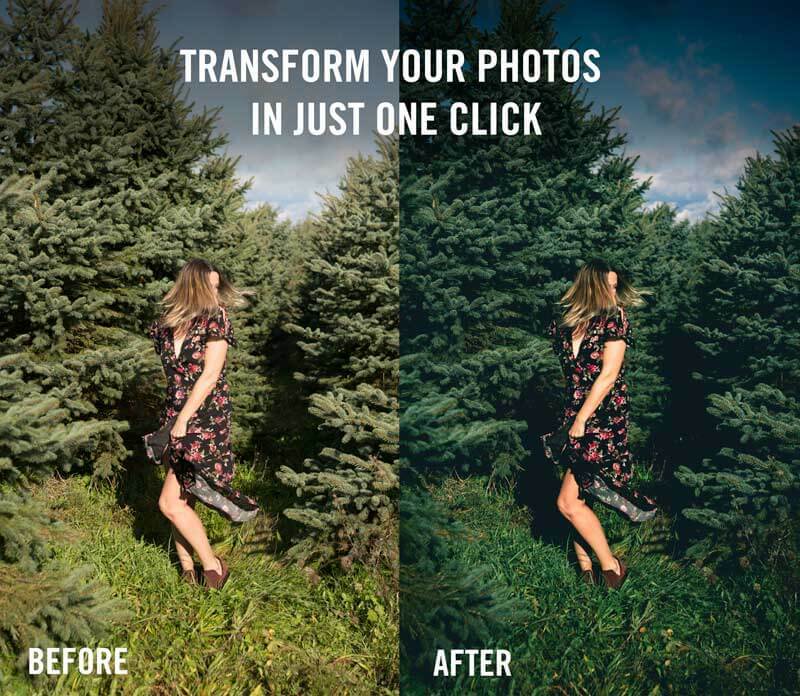 This will increase your chances. If there is any chance of rain you will not be able to go on a tour through Antelope Canyon due to the risk of flash floods. Want to experience gorgeous slot canyons like Antelope Canyon offers without the hoards of people? Water Holes Canyon is one of the best things to do in Page, Arizona as it offers tons of beautiful slot canyons to explore without a tour. As of 2018, in order to visit Water Holes Canyon, you have to go on a guided tour. Previously you only had to obtain a permit from the Tribal Parks Office. You can book a tour with Waterholes Canyon Experience. The Navajo National Monument is also one of the best things to do in Page, Arizona headed towards Monument Valley. The national monument is located in the northwest section of the Navajo Nation and is home to preserved cliff dwellings of Keet Seel built into the canyon. There’s a visitor center and a few trails nearby including one that takes you to the scenic viewpoint overlooking the cliff dwellings. You are not able to access the cliff dwellings, just admire from the distance of the viewpoint which also includes binoculars. The site was said to have been first occupied in 1250 and home to the Anasazi people. The site is incredibly interesting and you get a pretty incredible view and peek into what life looked like in 1250 here in the Navajo Nation. 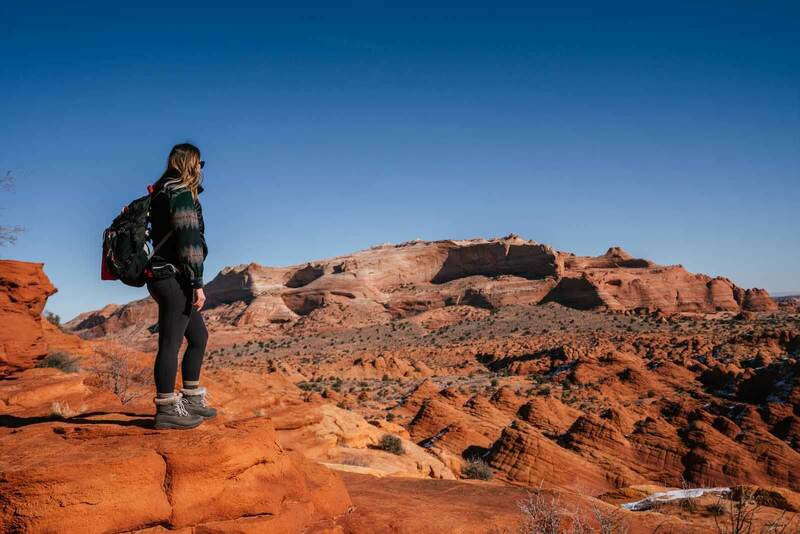 Another amazing place to explore and thing to do in Page, Arizona is head to the Paria Canyon-Vermilion Cliffs Wilderness which is home to the famous Wave hike, North and South Coyote Buttes and the Vermilion Cliffs. This area is managed by the Bureau of Land Management and many of the hikes require permits, some require you to apply in advance and some require you to head to the BLM office in person which is located in Kanab, Utah. 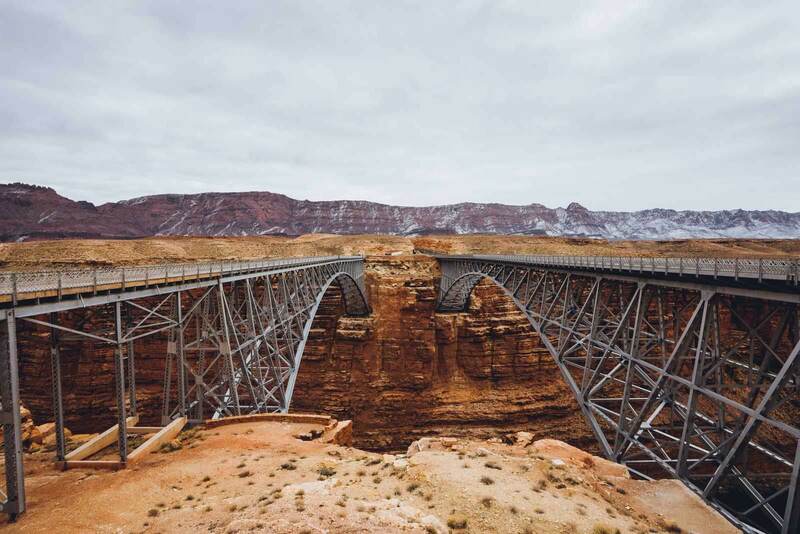 Another great idea for what to do in Page, Arizona if you’re headed towards Kanab or Lee’s Ferry is stop at the Navajo Bridge. There’s a set of two bridges here crossing over the Colorado River, a walking footbridge and the bridge for cars to pass with the dramatic drop below to the Colorado River flowing beneath and is considered the 9th highest bridge in the US. Prior to the first bridge completion, one of the only ways to cross the river here was through a ferry service at the mouth of Glen Canyon, named Lee’s Ferry. As time went on, a need for a more reliable and safe crossing of the river was in demand and 5 miles away is where the first Navajo Bridge was built. Today you can park on one side of the footbridge and walk across. There are locals selling goods here and the Navajo Bridge Interpretive Center. This is a great place to stop and admire the vast landscape and dramatic drop. You also get a backdrop of the Vermilion Cliffs here. On your way to Coyote Buttes from Page on 89, you will pass the massive and incredible 40 mile stretch of the Vermilion Cliffs. 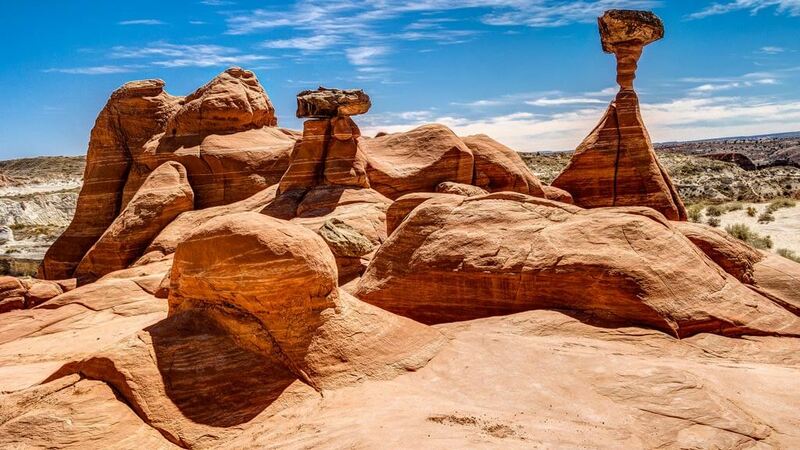 This is one of the most impressive roadside sites to see and best things to do in Page, Arizona especially if you find yourself passing this way to head towards Kanab or to Coyote Buttes. Follow route 89 to House Rock Valley Road, the same road that will take you to the trailheads in Coyote Buttes North, to pass the condor nesting and viewing area. The giant condor birds nest on the cliffs and you can catch a glimpse of them here. 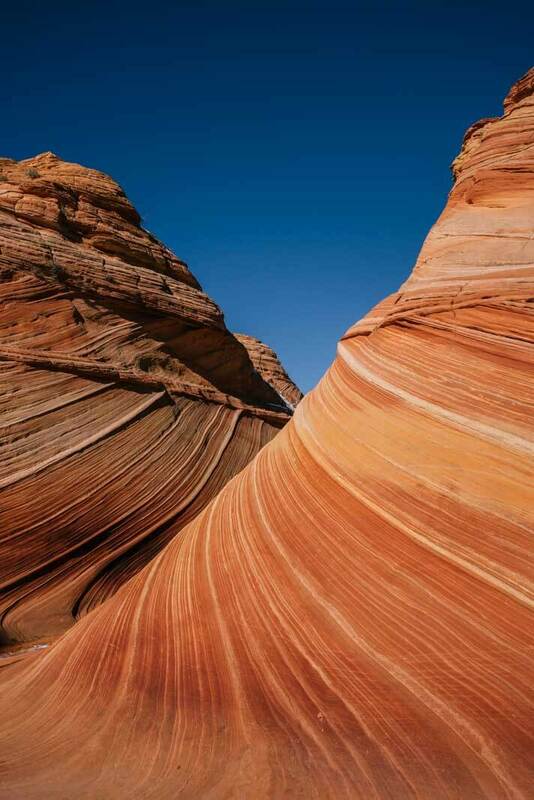 Inside the Paria Canyon-Vermilion Cliffs Wilderness area are the famous Coyote Buttes. Most people only make it to Coyote Buttes North for the famous ‘Wave’ hike. The Wave requires a permit secured either 4 months in advance online or in person at the BLM office in Kanab. Since BLM carefully protects this popular photography spot only 20 permits are given out daily. 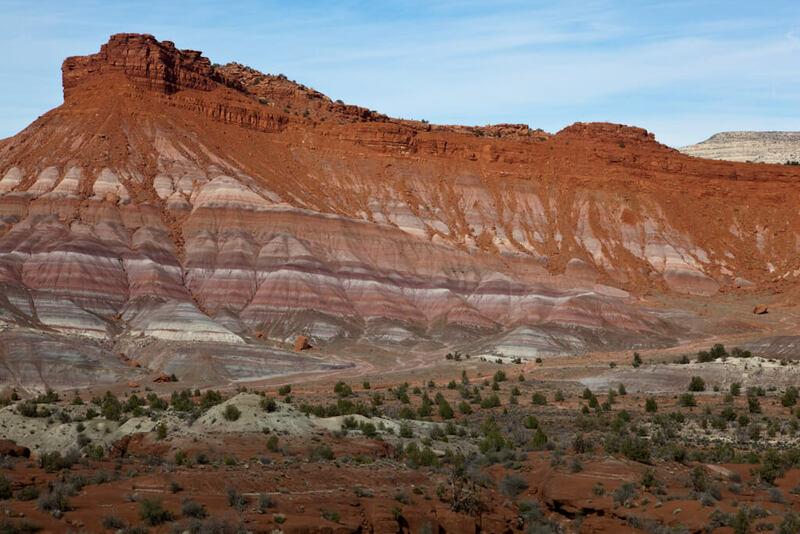 If you plan on visiting The Wave be prepared to secure your spot in advance or spend a few days in Kanab, Utah trying to be one of the lucky few to nab one of the 10 spots available for walk-ins. If you don’t get The Wave permit, no worries. There are tons of other great hikes and things to see here that make it one of the most sought after things for what to do in Page, Arizona. Coyote Buttes North also has the Wirepass Trail and Buckskin Gulch. Wirepass is a cool trail that can be done in a day and meets up with Buckskin Gulch where you can just hike a bit of the longest slot canyon in the US before turning around. 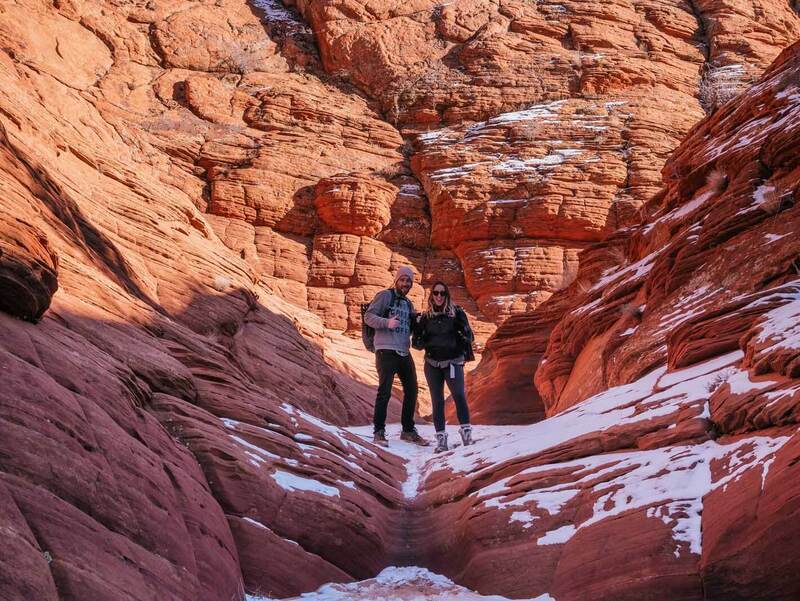 If you’re ambitious enough to want to do the entire Buckskin Gulch trail you will need to plan very carefully as this is considered one of the most dangerous trails in the United States because of the flash floods notorious in the region. You will also have to require a permit as it is often an overnight trail. Coyote Buttes South is often much less visited than the north but offers incredible trails through red rocks, hoodoos, teepees, and other sites that make you feel like you’re in another world. This is one of the more underrated spots in the area for sure. In order to access Coyote Buttes, you will need to come with a 4WD or AWD vehicle to reach the trail heads. When the roads are too wet the roads are completely impassable and undriveable. To obtain permits for hikes and to find out current road conditions be sure to contact the BLM office in Kanab, Utah. Another increasingly popular hike that was unheard of by most in the Paria Canyon and Vermilion Cliffs area is White Pocket. 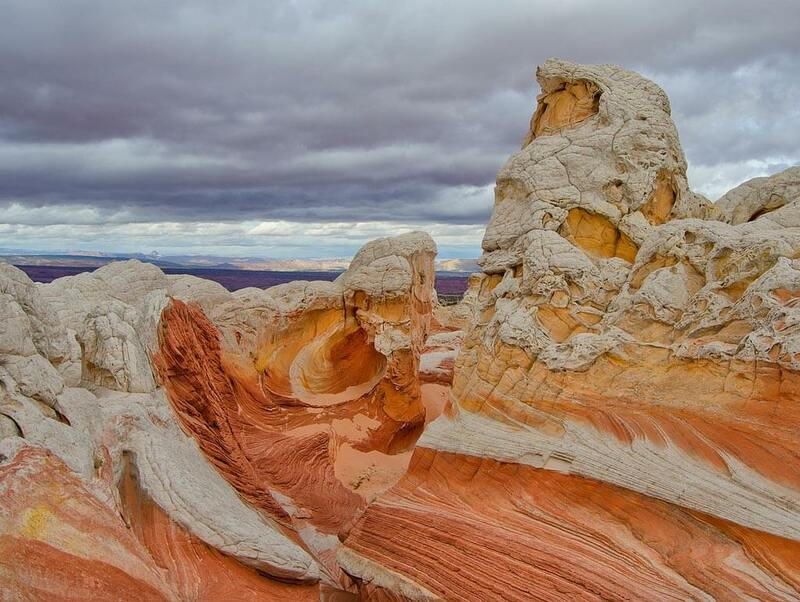 This trail takes you to incredible rock formations, much like the others, but instead of just orange and red, White Pocket has a mix of swirling patterns of colors with white making it a stunning place for photography and another great alternative if you do not obtain the highly competitive Wave hike. Do not attempt this section of the road without a 4WD or AWD vehicle as you will be driving through more sandy roads with sharp rocks, you do not want to be stuck out here as there is no cell service. Note that if any of the activities you want to do require permits you need to secure online in advance or visit the BLM office in Kanab, Utah. Another must see spot in the area and what to do in Page, Arizona is visit the MASSIVE Grand Staircase-Escalante National Monument. Even though this national monument full of an array of colorful cliffs, dinosaur remains, and slot canyons is huge, it’s actually about half of the size of what it used to be. In 2017, President Donald Trump reduced the Grand Staircase-Escalante National Monument almost by half breaking it up into three sections Grand Staircase, Kaiparowits and Escalante Canyons making the area vulnerable to drilling. Since we are focusing on best things to do in Page, Arizona we will only mention the easily accessible spots near Page. The toadstools hike is a great and easy option for what to do in Page, Arizona in the Grand Staircase-Escalante National Monument. 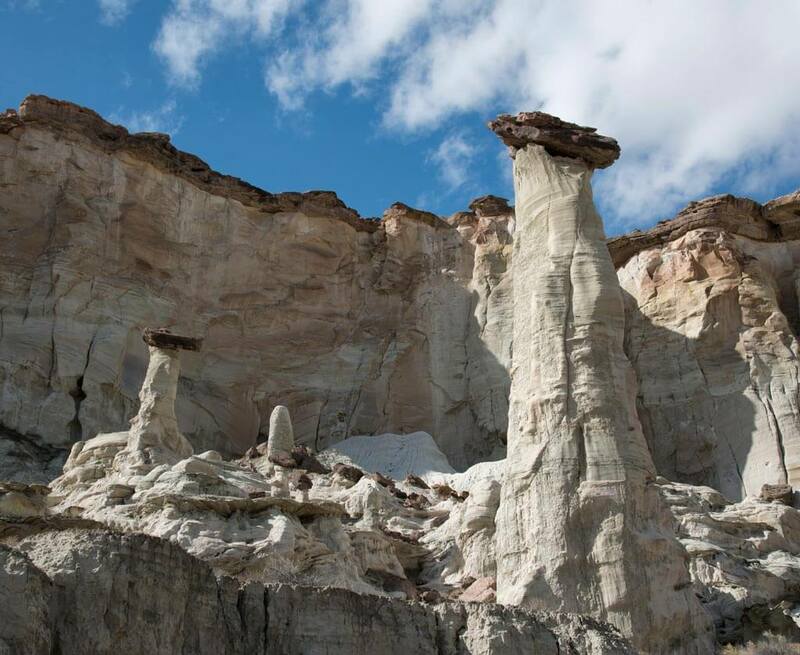 The hike is only a 1.5 mile roundtrip that passes incredible rock formations and hoodoos miraculously balancing on top of another and rocks that have formed the shape of mushrooms, hence the name toadstools. Exploring this area makes you feel like you’re somewhere otherworldly. Another great stop in Grand Staircase-Escalante National Monument and awesome thing to do near Page, Arizona are the Wahweap Hoodoos. All hoodoos look like something out of this world, but these hoodoos managed to look even more alien with their white color and brown caps. The entire hike is 9 miles with return and can take up to 5 hours depending on your fitness ability and number of photo stops – those always get us! This hike is underrated in the area and sees less visitors than nearby hikes. There’s a great possibility you could have this trail to yourself. With that being said, it’s also crucial that you’re an experienced navigator and a GPS is highly recommended. Stop at the Big Water Visitor Center before to get an update on the current conditions of the trail. You also need a 4WD or AWD vehicle with high clearance to access the beginning of the trail. 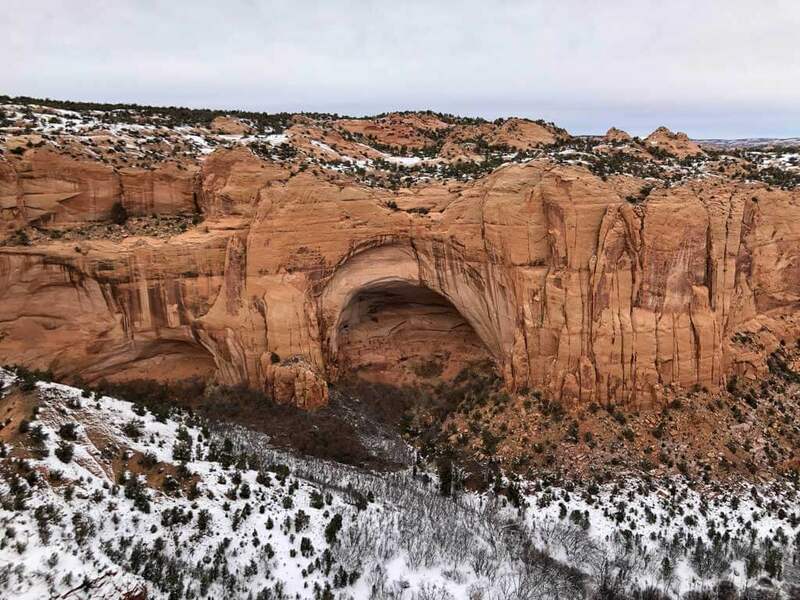 One of the most visited spots in Grand Staircase-Escalante National Monument and cool things to do in Page, Arizona is visit the Hole-in-the-Rock monument. This monument got it’s name from Mormon settlers in the late 1800s. This area was almost impassable by early settlers because of the vast vertical cliffs of Glen Canyon. There was a 45 foot cliff that the settlers need to get past so they spent 6 weeks forming the hole in the rock with dynamite so their caravan of wagons could pass and settle in southeast Utah. The terrain can be rough and if you wish you can even hike down to Lake Powell from here, but the trail is not maintained so you need to be very cautious if you do proceed this way. Getting to Hole in a Rock requires a 62 mile drive through Grand Staircase-Escalante National Monument and Glen Canyon Recreation Area. It is advised to have a 4WD or AWD vehicle and to carry extra water in case of an emergency as this area isn’t patrolled often. During wet weather, the road can be impassable. Before attempting this trail be sure to contact the Escalante Interagency Visitor Center at 435-826-5499 or check the road conditions with the BLM office. Pahreah Ghost Town or Paria townsite is one of the coolest things to do near Page, Arizona on the route to Kanab, Utah. The ghost town is located along the Paria River and was occupied in 1870-1929 first by Mormon settlers. After, the site was used as a filming location for western films through the 1940s – 1960s. There is very little left of the original settlement today due to wear and tear from abandonment and weather. In 1999-2001 volunteers rebuilt the set for visitors, unfortunately, someone committed arson and it fell to its demise in a fire. There are signs dotted around the area telling the history of the townsite. Besides having a cool ghost town and old movie set to visit the mountains and cliffs in the backdrop are a show stealer with layers of red, orange, purples, and white. Another one of the awesome things for what to do in Page, Arizona is visit the nearby national parks including Grand Canyon National Park. 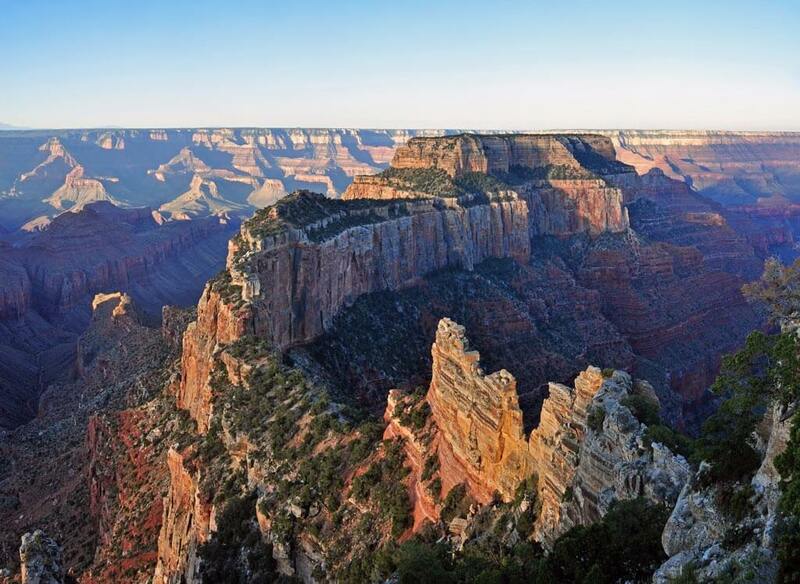 There are two different sections to the Grand Canyon National Park, the North Rim and the South Rim. The North Rim is far less popular and only sees about 10% of visitors that the South Rim sees so it’s a great place to go if you’re trying to get away from the crowds in peak season. The Grand Canyon National Park is one of the few Dark Sky Places in the US. 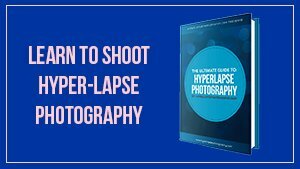 So take advantage of this if you are a star gazer or love star photography. The North Rim of the Grand Canyon is far less visited than the South and is still just as magnificent and mind-blowingly beautiful. However, the only downfall is that the North Rim is closed through the winter months unless you get a backcountry permit for camping and snowshoeing. The lodging and restaurants are only open from May 15 to October 15 annually. 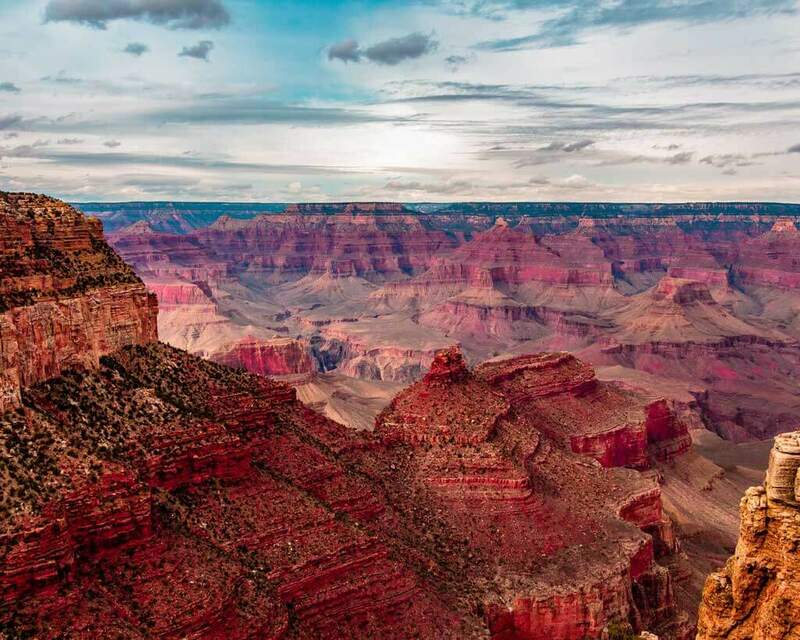 Some of the most incredible things to do in the North Rim are visiting the popular viewpoints like Bright Angel Viewpoint, Point Imperial Viewpoint, and Cape Royal Viewpoint. 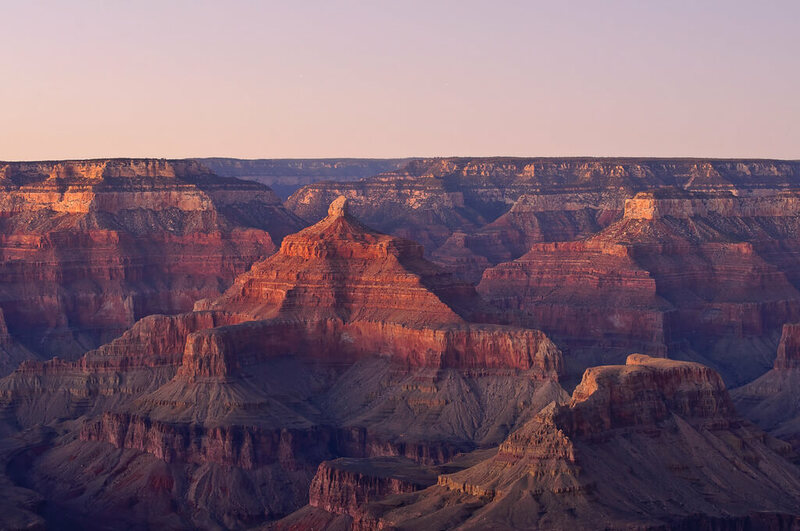 The South Rim is one of the most popular destinations to visit in the Southwest and an easy idea for what to do in Page, Arizona. There are plenty of scenic viewpoints and historic sites to see including the impressive National Geographic Visitor Center and IMAX theater. There’s also the Yavapai Geology Museum and the take off points for horseback tours through the Grand Canyon. The best viewpoints include Lookout Studio, Yavapai Point, Mather Point, Moran Point, Desert View and Watchtower, as well as Lipan Point. Popular hikes include Grandview Point which takes you to one of the of highest points in the South Rim. Another is Yuma Point which is a difficult day hike for experienced hikers looking for some more remote areas of the South Rim to explore. One of our favorite things to do near Page, Arizona is drive to Monument Valley, Utah. Just after the town of Kayenta you slowly start entering the landscape that has shaped America and the world’s view of the West. This area is famous for being the filming location for many of the most famous western films as well as a backdrop for modern films like the running scene in Forest Gump. Monument Valley is not a National Park, it’s actually a part of the Navajo Nation Reservation near the four corners area. You can recognize Monument Valley by its large and massive buttes soaring out of the ground touching the sky in the Colorado Plateau. 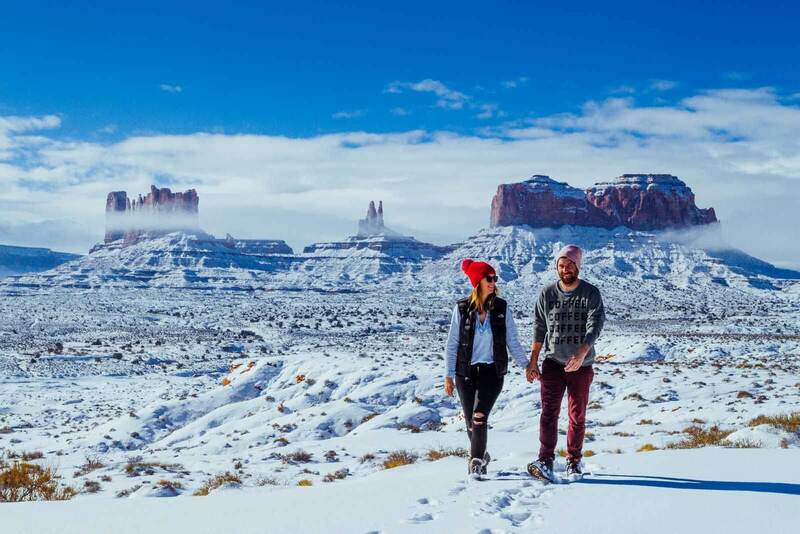 Visitors can stay overnight in one of the few hotels in Monument Valley, Kayenta, or Mexican Hat or do a camping expedition with a tour company. Be sure to stop at the visitor center for one of the most iconic views of Monument Valley and the starting off point for the 17 mile scenic drive through the valley after you pay your admission fee. This is the only area accessible to the public without a guided tour. Continue through Mystery Valley and Hunts Mesa on a guided tour with a Navajo guide. There is no way to access this area without a local Navajo person. We visited in the winter after a few inches of snow just dropped and the 17 mile scenic drive was closed to visitors. DO NOT ATTEMPT to pass when it is closed. No one monitors this area and cars ignored the signs and drove anyways getting stuck. Local Navajo volunteers had to pull people out. You also need a 4WD or AWD vehicle to drive on the 17 mile scenic drive since it’s not a paved road. Also, be sure to continue on the 163 to Mexican Hat, you’ll almost be all the way here if you plan on stopping along the road for the scenic pullovers to take some of the scenic shots of Monument Valley in the distance with the road leading the way. This is a small town that has a gas station, hotels, and a few restaurants if you’re lucky will be open for business. One of the most famous draws here is the Mexican Hat rock formation as well which is really cool! Another great idea for what to do in Page, Arizona is head towards Flagstaff and Sedona to visit the Coconino National Forest. The Coconino National Forest is massive and spreads across 1.9 million acres and is considered one of the most diverse in the country with areas like the southwestern desert, pine forests, alpine tundra, volcanic peaks, and red rock formations. There are three districts, the Flagstaff District, the Red Rocks District, and the Mogollon Rim District. We will only focus on the Flagstaff District and the Red Rocks District since they are the closest to Page, Arizona. 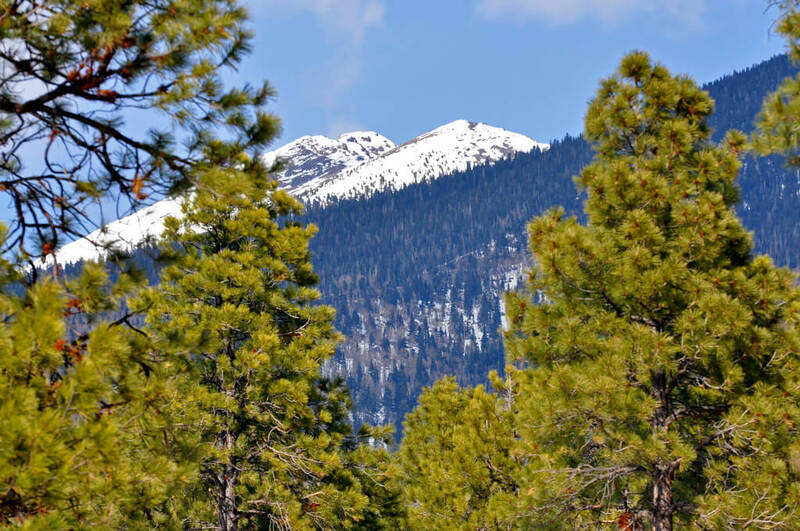 The Flagstaff District is located closest to Page and includes Arizona’s tallest mountain peak, Humphrey’s Peak. There are lava fields and lava tubes to explore including the Lava River Cave. The Flagstaff District is also home to the Mormon Lake, Ashurst Lake, and Marshall Lake. All of the lakes offer various activities including hiking and fishing. Don’t miss the Lowell Observatory at Anderson Mesa either where Pluto was discovered in 1930 and is considered the 5th largest telescope in the US. The Red Rocks District of the Coconino National Forest is closer to Sedona and still an easy day trip or thing to do in Page, Arizona just a few hours drive away. 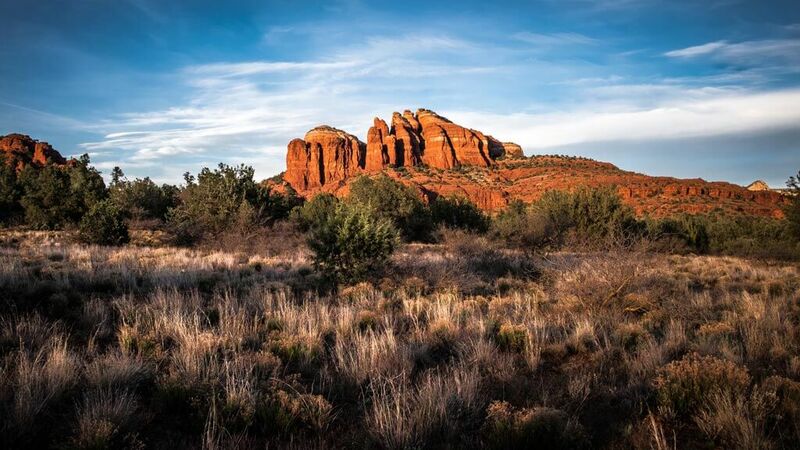 The famous red rocks of Sedona have been the setting and inspiration for western films and books for years plus a place for natural healing and enlightenment. The most popular spots and points of interest include Cathedral Rock and Devil’s Bridge as well as Oak Creek Canyon, one of the most popular spots in Coconino National Forest. You can easily drive the scenic views of Oak Creek Canyon or stop at the Oak Creek Vista for the vast panoramic view. Cathedral Rock is considered one of the energy vortices (vortex) in Sedona. Natural healers and meditation aficionados gather here to harness the energy and healing powers they believe to be coming from the vortex sites. Don’t be surprised if you see healing rituals or meditation or yoga going on when you visit Cathedral Rock. Interested in learning more about what an energy vortex is? 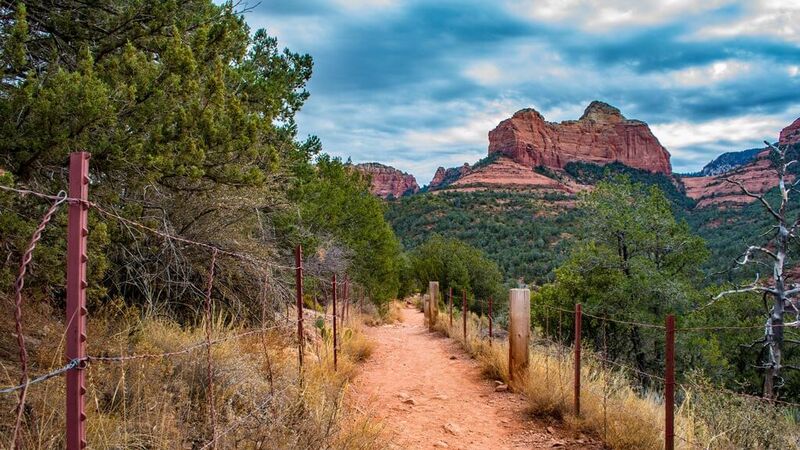 Check out this guide from Visit Sedona. Devil’s Bridge is a 4 mile hike to the large sandstone arch formation and can get very busy and crowded in peak season. You will want a high clearance vehicle for many of the sites in Coconino National Forest. Be sure to always check road conditions in advance at the visitor center. 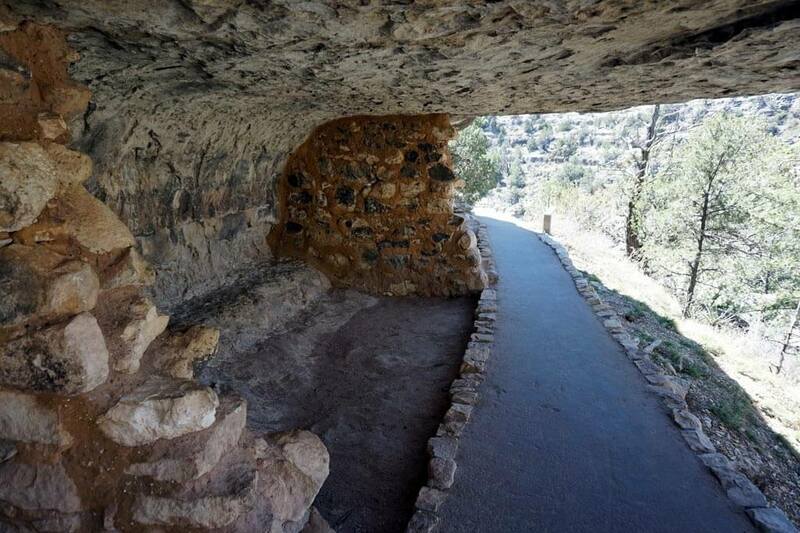 Not technically a part of the Coconino National Forest but neighboring it next to Flagstaff is Walnut Canyon National Monument home to cliff dwellings, canyons, and hiking trails. Two of the most popular trails include Rim Trail and Island Trail. Rim Trail is easy and great for everyone to enjoy. The entire trail is under a mile with return and features two canyon viewpoints as well as a pueblo and area where ancient inhabitants once lived. The Island Trail is one mile and much more difficult with stairs and steep drops and climbs in and out of the canyon. On the trail you will see 25 cliff dwellings and gorgeous canyon views. 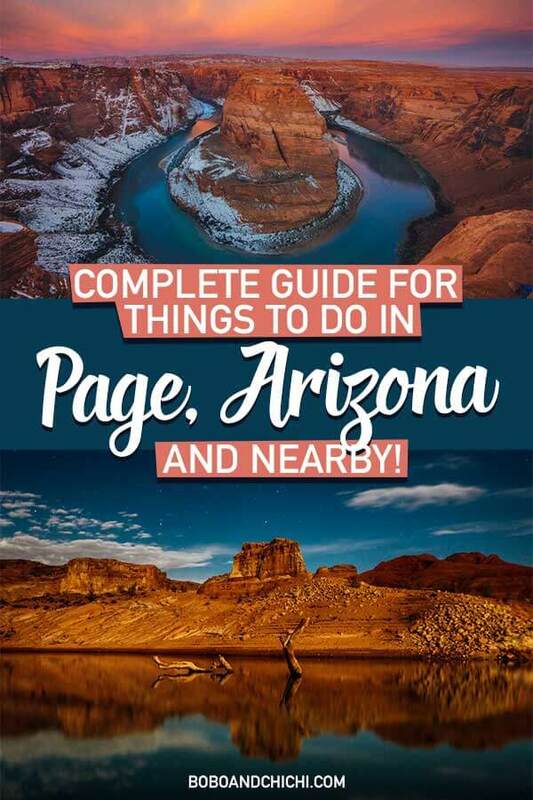 Exploring all the best things to do in Page, Arizona and nearby require a few things to know beforehand as well as tips that will help you along the way. Be sure to research all planned hikes to find out if you need a permit beforehand. Many hikes do require this for your safety and the preservation of the delicate areas you plan on hiking to. If you trespass in an area that requires a permit without one you risk the chance of receiving a hefty fine. Plan your visit or road trip with an AWD or 4WD vehicle. Many of the trailheads and access points in these parks and reservations have rough roads and require vehicles with high clearance and ability to drive on rough terrain. Make sure to check road conditions beforehand. Many trails are not passable when too wet and you do not want to get stranded somewhere secluded with no cell service and very little monitoring. You can always check in with the local visitor center or ranger station if you’re not sure. Check weather conditions ALWAYS before your hike because your life depends on it. Do not take this lightly, the Southwest is notorious for dangerous flash floods especially in the summer. If you’re not sure check in with the visitor center or ranger station closest to where you plan on visiting. Brush up on flash flood survival skills. This is a serious danger in the area that can end fatally. Flash floods can even happen on days that are clear with no sunshine. This guide is helpful. Bring extra water in the summer months. The temperature in this region easily gets to over 100 degrees in the summer months which poses a serious threat to dehydration on trails. Come prepared and bring extra water. Have extra water in your car in case you get stranded on a long road leading to a trailhead. Be respectful to nature. This should be common sense but there are a lot of idiots out there. This might not be you, but if you SEE anyone doing something harmful to the environment, call them out or report them to a ranger. This land is sacred and we all need to do our part in taking care of it. 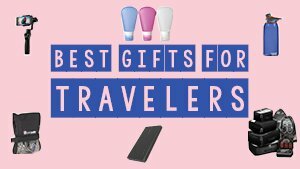 Wondering what essentials to bring to Page, Arizona? We have you covered. Some of the most important things you need to bring to Page, Arizona for all the great activities include proper hiking gear. We highly recommend the bare minimum of having proper hiking shoes as many of the trails require good traction and you will want to nice ankle support hiking boots offer to help prevent you from rolling your ankle in the middle of a remote trail. In case there was rain recently you will want to make sure you also have proper waterproof and weatherproof footwear as well. We have selected some great options below. We also recommend having a good working GPS that also has a personal locator beacon feature if you plan on doing any of the more difficult or hikes that require excellent navigational skills. There is little to no cell service in this region let alone on the trails and having a GPS will prevent you from getting lost as well as a personal locator beacon if heaven forbid something does happen and you need help. Another clutch item to have is a nice Camelbak backpack that has a bladder so you can stay hydrated. When you’re hiking here it is crucial to stay hydrated especially in the hotter months. In the winter many of the accommodations prices reduce significantly due to being low season including Lake Powell Houseboat Rentals. Consider visiting this time of year for less crowds as well and a better chance to get permits to some of the most desired hikes. A classic motel and basic accommodation in the heart of Page, Arizona. This motel offers complimentary breakfast and a popcorn machine in the lobby, an outdoor pool, and is walking distance to many great restaurants and next door to the bowling alley if you’re looking for extra entertainment. We found the staff to be very friendly and helpful here and is a perfect place to stay if you’re looking for a basic room and a great deal. This is another great option for where to stay in Page if you want to be right on Lake Powell next to Wahweap Marina. Our family stayed here before our Lake Powell houseboat week and it was the perfect place accessible to Page and all the things to do nearby while being right on the water. There’s an outdoor pool as well as many restaurants on site to choose from. The Hyatt is a great option for where to stay in Page offering up comfortable and modern rooms with an outdoor pool and restaurant and bar on site. This is one of the finer choices to stay for a place to rest after all your day activities in the area. Found this post on the best things to do in Page, Arizona and what to do in Page, Arizona helpful? Bookmark for later or share the love on Pinterest below!